As we get ready for the big bumwinebob.com birthday bash LIVE this Sunday on Bumming with Bobcat, it was time to put down our hard sodas and craft beer and pick up a bottle of a classic bum wine for this special occasion! Over the past two years we have featured a plethora of different bum wines and various concoctions on the site, so sometimes it's hard to find one that hasn't been covered yet. 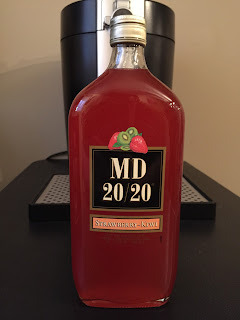 Luckily for all you readers out there I was able to get my hands on a bottle of a classic MD 20/20 that we haven't had the privilege of spotlighting on the site yet. 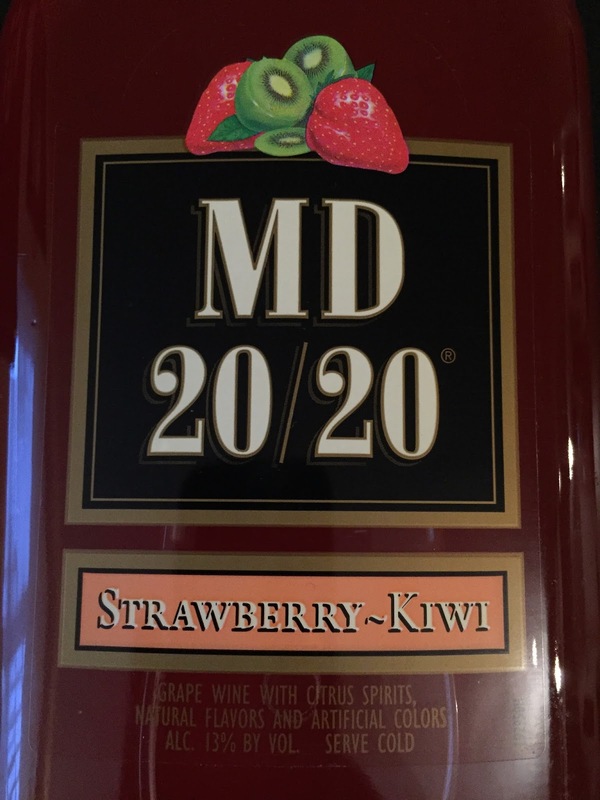 On tap today we have a vintage MD 20/20 that the 20/20 Wine Co. in Westfield, NY describes as "a savory sipper with tropical tangs". What is it you ask? 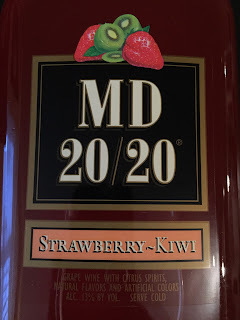 MD 20/20 Strawberry Kiwi is the BWB Bum Wine Of The Week! When opening the bottle you can smell what seems to be strawberry and it really doesn't taste half bad. I would say it almost tastes similar to the Night Train Express without the extra kick. It does have some sort of strawberry syrup flavor to it with that alcoholic burn that gets you right at the end of it as it travels down your throat. If you head on over to md2020wine.com you will see the new website for all their fine beverages. "THE "ORIGINAL" READY-TO-DRINK Our grape wine is made with juicy, luscious fruit infused with tasty flavors to create a unique variety of MD 20/20 selections. Enjoy MD 20/20 cold any way you like: Chilled, Cocktail, Rocks." Below their warm and welcoming intro you will see a list of all the current MD 20/20 wines that are in production today. I know that there are others still out on the market, so I'm not sure if they gave up on adding the rest to the site or they are just trying to make my life more difficult by not featuring them on the front page. What's the deal guys? MD 20/20 Strawberry Kiwi is a BWB approved choice coming in at the standard 13% ABV and ready to drink straight from the bottle! Start your day off the right way and pick up a bottle and enjoy! Be sure to tune in LIVE this Sunday at 11am ET to Bumming with Bobcat as we host the Biennial Bum Wine Celebration! We are celebrating two years of bumwinebob.com along with our 50th LIVE episode of the bumcast! Tell your friends and join the party! Cheers!